At present , there are more than 1 billion PCs which are using Microsoft Windows. And all these users don't use Genuine Microsoft's Windows. A huge amount of users are operating pirated version of Windows. This thing has forced Microsoft to take action against these pirated Windows. Now Microsoft is bugging the entire pirated and non-genuine windows version. If you are a Windows user and using it without any license or using its pirated version then there you might come across this error "You may be a victim of software counterfeiting error. This copy of Windows is not genuine and is not eligible to receive the full range of upgrades and product support from Microsoft". 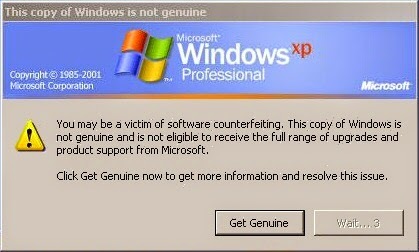 Users who are using or have used non-genuine version of Windows knows very well about this popup. What Causes This Problem To Occur? This error or popup shows up when you tries to update your Windows over the internet, at that time this popup window will occur in front of you. The only reason is because you update a non Genuine copy of Windows. This is called Windows Genuine Advantage or (WGA) it is an anti-piracy system created by Microsoft that enforces online validation of the licensing of several recent Microsoft Windows operating systems when accessing several services, such as Windows Update, and downloading Windows components from the Microsoft Download Center. This problem is common on Windows XP but now a days it also appears on Windows 7 and Windows 8. So if you are facing this problem then you are at right place. I am having some ways to fix this error in few minutes. Note:- If your copy of Windows is genuine and you are facing this error then simply restore your system. On updating if this error occurs then system restore may solve your problem. Read Also:- How To Disable Blue Seen Tick Marks In Whatsapp? If restoring system doesn't solves your problem then just follow the guide below to fix this error. Launch Windows Task Manager (Shortcut Key- Ctrl+Alt+Del). After that just switch to Process tab, search for process "Wgatray.exe" , select it simply and click on end process. Then restart your PC and Log-in into the Safe Mode by Pressing F8 continuously before windows boot screen appears. Also delete Wgatray.exe from this location C:\Windows\System32\dllcache (dllcache might be hidden, just enable hidden files from folder options). Now press Window Key+R and type regedit to open Registry Editor. Navigate to HKEY_LOCAL_MACHINE\SOFTWARE\Microsoft\Windows NT\CurrentVersion\Winlogon\Notify key. Delete the folder names as WgaLogon and all its contents. Just restart your system to enable the changes. If this method doesn't works for you then simply download a small tool RemoveWGA. This is a little tool that claims it can remove the intentionally-deployed Windows Genuine Advanced Notification, which means it could make things a little bit quieter for your computer. Especially that the update which is being flagged as 'Important' could pose a security risk as it opens a connection to Microsoft's servers every time the files are loaded. So this was a simple trick to remove or fix error You May Be A Victim Of Software Counterfeiting Error. Hope it will help you.